Uh-oh. The "Where does the Eastside begin and the Westside end" argument is bound to surface soon. Some say Western is the the boundary, some say Highland is the boundary, and some even say that Main Street is the boundary as it's the historical dividing line. Egh. i actually write the 'blueprint' feature for the magazine. i believe that the 'eastside' boundaries that the magazine will focus on are somewhat fluid and involve more of a conceptual demarcation, rather than simply addressing where the street names are prefixed with east or west. i personally find it interesting to cover areas that do not get a ton of positive media attention (hence an article on South Central), and i do intend to make the jump over the river and have already spoken to developers in boyle heights and lincoln heights. But this is just my inclination, and obviously the 'eastside' refers to a certain demographic, not to arbitrary city geography. Maxwell: Thanks for writing. Your observation that a new culture has been developing under the guise of Eastside is astute, and frankly allows me to see a growing identity that forms a blanket on a changing face of Los Angeles located this side of Vermont and over to the River. But the argument that has already been made to both editor and publisher of your publication (a good one, by the way) is the identity was already established. That's something I'm sure will be worked out in time, or due to the nature of the content the publication covers and the demographic dollars sought to tap into, will not something to work out. Either way, the Eastside vs Westside debate is interesting, yet sometimes exposes when and where a person/person's family came to Los Angeles. Good luck with the pub. It's peculiar that those that find the term Eastside to be "fluid" are almost always those that start their LA journeys from a base far west of the river. And it's often a trip they've just begun. For the communities on the Eastside, with long ties and a history in the city, that fluidity isn't there: it's just a fancy way for newbies to stomp on our identity. I think it is interesting that our little magazine has sparked such debate and outright concern. A suggestion for everyone, start off by reading the magazine, you'll find within it's pages a fresh new perspective that looks east. We hope to grow the magazine and over the long-term hope to earn the trust of readers and advertisers for years to come. Only time will tell so give us a chance. The July and August editions are shaping up to be great...so stay tuned. Oh and by the way, our Downtown circulation is 12,500 with an additional 17,500 copies direct mailed to households just West of DTLA. Come see us this weekend at the Loz Feliz Street Fair on 6/3, or next weekend at GP on Grand Ave 6/10. 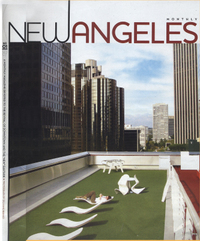 (View From A Loft Note) Charles N. Gerencser is the Executive Publisher of New Angeles Magazine. 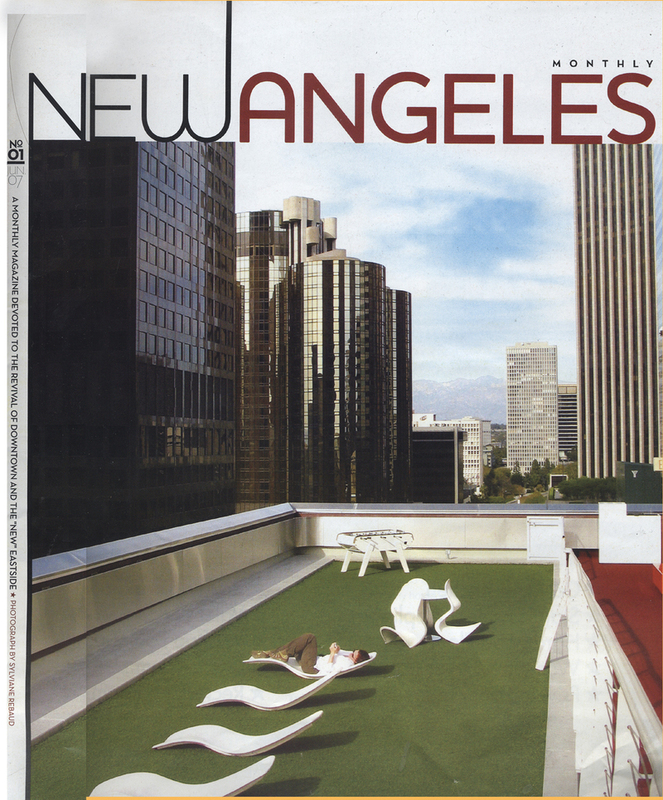 The launch party for New Angeles will be held in the Arts District, at Bordello. Sorry Maxwell but I still don't think you're justified in using the term Eastside even as it applies to your fluid demographic. It doesn't make any sense. Using Eastside to apply to areas around Silverlake is a new concept within the last six years or so and is due to the fact the new LA residents have either been too lazy or racist to explore and acknowledge the other half of the city. Why you would want to promote such a blatant slap in the face to the history of Los Angeles and it's residents while trying to promote Los Angeles culture is incredible! As a Latino who works with cultural muralists, and wrote for Chicano Arts Magazine, I see your point and it is valid. However, in the scope of Los Angeles History since it's inception as a city, the Eastside did include Silver Lake and Echo Park, etc. While those in East L.A., Boyle Heights, and Lincoln Heights can and deserve having attention focused on community uprooted, L.A. history did not start in 1945 or 1955. I always maintained if one culture doesn't want their face slapped by revisionism, ie. Chicanos/Latinos/Hispanics, there has to be a respect for those who lived in East L.A. at one time (Japanese, Jewish, Chinese) as well as those who did the first idealogy of what Eastside was. Racism is too strong a word, and East L.A. proper is 1/3 of the city, not 1/2. The valley is also L.A.
well living in Lincoln Heights, I have to say I wander often in downtown arts district and cross that 'river'. and it is quite different. but its still LA. any way you take it. and the more we come together the better. we are all in it together. meaning the whole planet actually. The mid-century eastsiders took the term with them when they vacated LA... to the eastern suburbs. I've heard of the entire region east of downtown all the to La Habra called "eastside". The most relevant historical fact to start with, regarding east, west, and south LA, is the fact that LA was (made) racially segregated in the early 20th century, and that's why people lived where they lived. This talk about our multicultural history is a farce. Multi-culty was destroyed during LA's greatest period of growth, and we're still dealing with the aftermath. "However, in the scope of Los Angeles History since it's inception as a city, the Eastside did include Silver Lake and Echo Park, etc." My grandmother has lived in Echo Park since the mid 1930s until now and has been involved with numerous Echo Park civic groups. I asked her if at anytime Echo Park and Silverlake had been considered the "Eastside" and she laughed in my face! She often uses the term "Eastside" when describing parts of Chinatown, Lincoln Heights and Boyle Heights but would never use it for her part of town which she said at one time was called the "Westside." I am also quite familiar with the history of Boyle Heights as my great grandmother, my grandmother, my father and myself all grew up and/or lived there at one time. Boyle Heights also had a a large Armenian community too. Anyone who has lived in the neighborhood for longer than a generation is most likely knowledgeable about the varied ethnic and mostly immigrant, history of Boyle Heights.